We are pleased to introduce our line of GPR non-metallic knives. GPR is a fiberglass and phenolic laminate that looks somewhat like micarta or G-10. However, it is considerably stronger. It is even stronger than carbon fiber. It is attractive, usually black, can take a high polish or a satin finish, and is not affected by moisture or heat.Why a non-metallic knife? A GPR Knife in a stitched Kydex tm sheath is lightweight and can be carried very comfortably. In a neck sheath, it can be tucked away under uniform shirt or jacket and forgotten until needed. 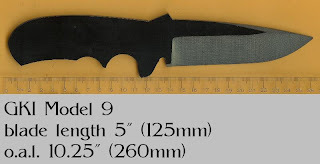 Granger Knives' GPR Knives are nowcarried by some Federal Agents for use in covert operations where a steel knife would be exposed by a metal detector. GPR Knives appeal to undercover police officers for the same reason. 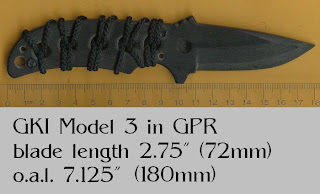 The GPR Knife is intended for use as a secondary or covert means of self defense. It is not intended to be a utility knife. They excel at cutting seat belts and the enemies of society and America. The GPR Knife possesses strength and edge-holding abilities far beyond "plastic knives" like zytel tm or G-10.How strong is a GPR Knife? We wondered the same thing when we first entertained the idea of producing such a product. The raw material is available to us in two thicknesses, 5/32" & 1/4". We tested a piece 7" x 1 1/4" in the 5/32" thickness. We clamped half the piece to a stationary object then bounced 250 pounds of weighton the other half. The piece sustained no damage whatsoever! All of our GPR Knives are milled from 1/4" stock for even more strength. We were impressed and you will be too! 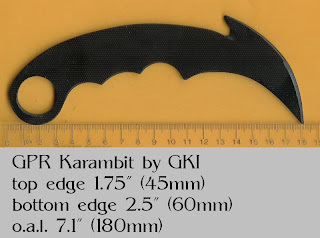 GPR Knives have a Rockwell hardness of 47.Granger Knives' GPR Knives are available with either a standard or serrated edge with an aggressive bite. All GPR Knives are chisel ground as this produces optimum cutting ability. Therefore be sure to specify if you are left or right-handed. GPR Knives are available with or without handle slabs. The knife can be resharpened in either of two ways. To preserve the serrated edge, touch up the teeth with one of the many serrated knife sharpeners. To resharpen the standard edge you may use a file. Or better yet, tape a sheet of 400 grit sand-paper to a 1/4" piece of glass about 6" wide and 12" long . Tape it tightly so that both edges of the sandpaper go around to the back. Then use it just like a sharpening stone. Each of our steel knife patterns are offered in GPR material as well. The BLADE SHOW in ATLANTA!